The systems of a Western Dragon are comparable to that of avians and pterosaurs. 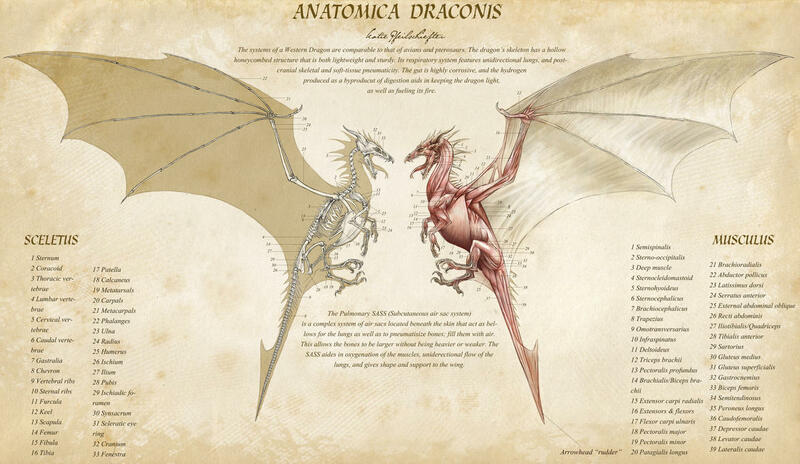 The dragon‘s skeleton has a hollow honeycombed structure that is both lightweight and sturdy. 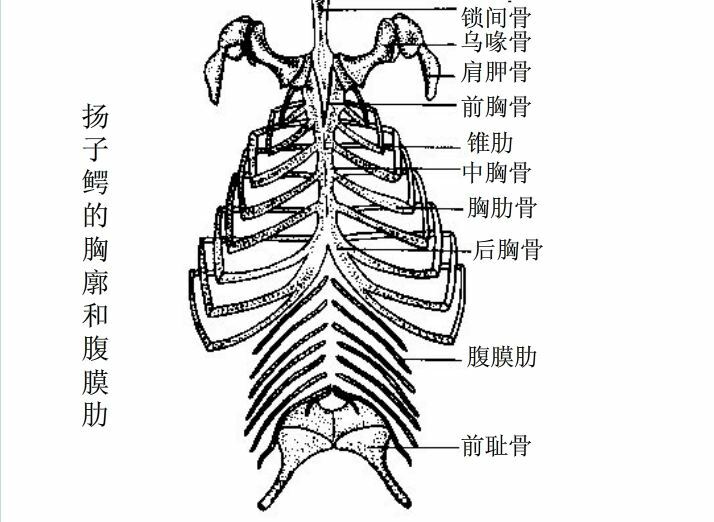 Its respiratory system features unidirectional lungs, and postcranial skeletal and soft-tissue pneumaticity. The gut is highly corrosive, and the hydrogen produced as a byproducut of digestion aids in keeping the dragon light, as well as fueling its fire. The Pulmonary SASS (Subcutaneous air sac system)is a complex system of air sacs located beneath the skin that act as bellows for the lungs as well as to pneumatisize bones; fill them with air.This allows the bones to be larger without being heavier or weaker. The SASS aides in oxygenation of the muscles, uniderectional flow of the lungs, and gives shape and support to the wing. Some of this may be quoting John Conway&apos;s pterosaur research: The Pulmonary SASS (Subcutaneous air sac system) are a complex system of air sacs located beneath the skin that act as bellows for the lungs as well as to pneumatisize bones -filling them with air, meaning the bones can be bigger without being heavier or weaker. To be specific, they have post-cranial skeletal and soft-tissue pneumaticity; meaning there are hexagonal (honeycomb structured) spaces and pneumatic foramina filled with air within the bone and some tissue. The pneumatisation in the wings perhaps being fueled by the SASS. The air sacs may have have played a structural role in holding wing shape and posture, as they do in some birds. This feature aids in the oxygenation of the muscles, and unidirectional flow of oxygen in the lungs. Their large lungs, coupled with their efficiency of exacting oxygen from the air serve to support their size and powerful flight muscles. The SASS would also allow the animal to control the mechanical properties of the wing, perhaps even allowing the inflation to be used in display as it does in some birds. Also from pterosaurs- the top layer of the wing is the actinofibrils, which help give shape and support to the wing. Long necks developed in dragons as well as in some birds and pterosaurs to allow ease of breath. Most dragons had long to mid-length wings for efficient flight and powerful downward thrust, but low wing beat frequency. And as wing-beat frequency determines respiratory frequency, this calls for bigger longer breaths, so a longer trachea and therefore longer neck is required to breath deeply without hyperventilating in flight. This creates the right dead space to tidal volume proportion to create the correct mixture of dead space air and fresh air upon inhalation and co2 concentration. Smaller dragons with shorter wings, higher wing beat frequency and shorter breath do not require this, and so have shorter necks. Long necks also come in handy for creatures with stiff backs/Vertebrae, they develop a long neck in order to get a better look around. Flying creatures are always very stiff, as too much flexibility in flight creates drag and makes it harder to support weight. This is observable in birds, who all have long necks. Even the small song birds necks are secretly proportionally long, their length is just hidden beneath feathers. When it comes to the larger birds, like herons and vultures, the necks are even longer. About Spines/Spikes: I see a lot of anatomical dragon sheets in which the spikes are made of bone, aka extremely long spinous processes. This could work for terrestrial creatures, but for flying animals its additional and unessential weight. The spikey bones have the potential to provide a very easy way for the animal to injure itself and more specifically its spine. Not to mention greatly reducing flexibility, (though this doesn&apos;t matter too much as a flying creature would be stiff backed to begin with). Spikes found on reptiles today are made of flesh and scale, a good example being the Thorny Devil. This lizard when calm can be very soft, but is able to make its spikes rigid and sharp when threatened. This is the kind of spike I&apos;d imagine a dragon utilizing. The most important muscle in the tail for dragons as well as dinosaurs and crocodiles is the Caudofemoralis. As this illustration shows only the surface musculature, the caudofemoralis which is a deep muscle doesn&apos;t show up much. But it&apos;s one of the largest muscles in the dragons body, as it affects the abduction of the hindlegs. The bigger the caudofemoralis, the faster the dragon/dino. Birds whose main source of locomotion is flying, and don&apos;t spend as much time moving on the ground as dragons do have short tails and small caudofemoralis. 1-6 Extensors Abductors Flexors 伸、外展肌屈肌** 是否為兩、三塊肌肉合在一起寫? 4-9 Crested laniary teeth/Carnassials (slicing/crunching) 現實生物有這種牙齒嗎?還是根據真實的醫學名詞延伸創作出來的? "No, you got it. There are a lot of muscles packed into that area of the arm that all do the same thing, flexing and extending the fingers/toes. I just grouped them all under one broad name to avoid cluttering up the page." "It was probably misspelled and indeed meant to be the illiotibialis"
"The best I can do for this one is suggest it was some kind of depressor muscle. This is the older version of western dragon anatomy I did, and outdated compared to the newer one. Some things in this one are redundant. I believed this muscle was pulled from a sheet on the facial musculature of a dog. I think it went up to the ear and aided in the movement of it for expressive purposes." "It is a proper noun, just a name for that particular bump that appears on the keeled sternums of birds. Could also just be called the rostrum." "Crested laniary teeth/carnassials are the same thing. They&apos;re just the common teeth found in predators used for sheering and tearing meat. Most everything from lions to bears to wolves have them."